In the Beijing Municipality, the Great Wall extends over 630km. Approximately 50km of the Great Wall was developed for tourism in areas like Badaling. The remainder of the Great Wall was left untouched, making it extraordinarily well-preserved. The Wilderness Great Wall of China is one of these areas which was left untouched, and has retained its wild and antiquarian atmosphere. 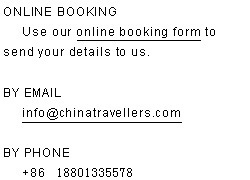 You will find approximate 30 sections of Great Wall around Beijing. Five of them were repaired for tourists. These sections of wall are Juyongguan, Badaling, Mutianyu, Jinshanling and Simatai. 6. Huanghuacheng Yellow Flower Great Wall: During summer, the whole area would be colored by yellow flowers and in autumn, the ground would be surrounded by yellow leaves, hence the name Huanghuacheng Great Wall (Yellow Flower Great Wall). This is a beautifully preserved section of the Wall favoured by nature lovers all year round. This section of Wall are still retains its original appearance since its construction in Ming Dynasty. But the climb isn’t steep until you get higher up. And in some parts the walk is very pleasant. There is a lake and a reservoir near the wall. The reservoir is called Huanghuacheng Reservoir. The lake is called Jintang lake. The water of the lake is cold and clear for all year round due to the numerous springs. The Huanghuacheng wall is divided by lakes and parts of Huanghuacheng Great Wall were damaged and fell into Jintang Lake after being bombed during the Anti-Japanese war a century ago. It makes this section of wall a very unique characteristic, distinguishing appearance from other sections of the Great Wall. The whole section of wall has 6 forts, 6 passes, 12 beacon-towers, and 32 guard towers. Of all the forts, Yaoziyu Fort is the best preserved. 7. Jiankou Great Wall: The Jiankou Great Wall (Arrow Lock) is located in Huairou County, 73 km north from Beijing City. This section was built in 1368 during the period of the Ming Dynasty. It is built of large white hill rocks which makes it very prominent from a distance. The major section of this Great Wall is built along a mountain ridge with tall cliffs on each side, and as a result of the lack of repairs, it is now one of the most dangerous sections of the entire Great Wall. This section is also a photographic hotspot due to its unique style, steep mountains and beautiful scenery. Jiankou Great Wall consists of 28 towers. Highlights include the "The Eagle Flies Facing Upward" watchtower and "Sky Stairs" featuring 80-degree inclines. "The Eagle Flies Facing Upward" watchtower appears extremely high as it was built on a mountain which forms the highest section of the Jiankou Great Wall. The eagles can only do so facing upwards before reaching the top of the tower when they pass through here. The "Sky Stairs" is another famous scenic spot with a precipitous stair whose angle of elevation is 70 to 80 degrees. The stairs are so narrow that it is barely possible to obtain a foothold. Other scenic areas include the Beijing Knot (the meeting point for three walls coming from different directions), the Nine-Eye Tower (a watchtower with three layers, and nine holes which look like nine eyes on each side), the Zhengbei Tower (a good place to watch the sunrise and the sunset), the Cloud Stairs (a section of the Jiankou Great Wall which rises like a staircase into the white clouds), and many other watch towers. 8. Zhenbiancheng Great Wall: Zhenbiancheng Great Wall is situated in Huailai County in Hebei Province. There is an ancient village nearby this section of wall which is called Zhenbiancheng village. It was a very important strategic pass. This section of wall is one of the most ruined and original wall around Beijing. Unlike other sections of wall, Zhenbiancheng Great Wall was built by stones instead of bricks. Even hikers seldom know this section of wall. This Great Wall construction rates highly as an architectural achievement. Some watch towers are round. The walk on the wall is also a bit difficult due to its disrepair and desolate location. But it is an ideal place for adventurous and experienced hikers and photographers. 9. Nine-Eye Tower: Built in 1543, Nine-Eye Tower is the largest-scale watchtower of Great Wall in Ming Dynasty, located at the boundary of Huairou County and Yanqing County. It was an important command post during the ancient wars, measuring 7.8m high and 13m wide. It has three layers, and there are nine holes which look like nine eyes on each side. Nicknamed by the locals "nine eyes tower", it contains the greatest number of crenels of any tower along the entire Great Wall - nine. There are many sights of interest along the way, from ancient history to Qin, Qi, Ming, and Qing Dynasty constructions. 10. Longquanyu Great Wall: Longquanyu Great Wall is a beautiful spot combining mountains, canyons, lakes, rivers, ancient villages and untouched Great Wall. It is located in Yanqing District, about 20 kilometers north of the Ming Tombs. It was built in Ming Dynasty (1368-1644) and it is one of the most ruined stretch of the Wall around Beijing. 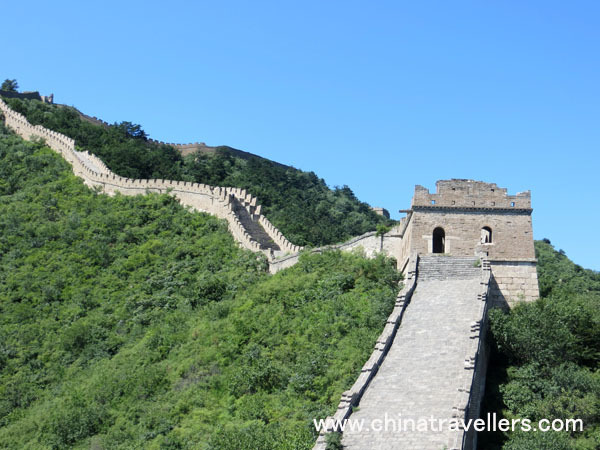 This section of wall is about 5 kilometers long and connecting Badaling Great Wall in the west and Xishuiyu Great Wall in the east. Longquanyu Great Wall is built of large granite which makes it very prominent from a distance. This stretch of wall consists of almost 10 towers. The towers and the wall retain their original appearance since its construction about 600 hundreds years ago. It has been out of repair for many years. Longquanyu Great Wall is an ideal place for adventurous and experienced hikers and photographers. The major section of this Great Wall is built along a mountain ridge with cliffs on each side. In the middle of this section of wall it meets a sheer cliff which is a natural barrier.